Paleo at Penn: Tikka Masala-Inspired Coconut Beef Curry and "The Six C's"
Tikka Masala-Inspired Coconut Beef Curry and "The Six C's"
I could go on about how much I love Indian food all day, but instead I'm going to give you two recipes that work amazingly together: Tikka Masala-Inspired Coconut Beef Curry and "The Six C's." 1. Heat coconut oil in a pot. With the heat on high, add in onions and stir frequently, then keep adding in spices and stirring until onions appear to be done. 2. Add in beef and cook until brown. 3. Add in tomatoes and stir well. Then add in coconut milk, almonds, and coconut flakes. Stir well, then bring to a boil. Cover and let simmer for approximately 45 minutes. I originally wanted to serve this over cauliflower rice, but my lack of food processor and the fact that I was using frozen cauliflower led to an epic fail. So I decided instead to do mashed cauliflower with some spices. It coincidentally turned out that all of my ingredients started with the letter "C"... So here's "The Six C's": Cumin-Coriander-Cinnamon-Curry Coconut Cauliflower! 1. Boil cauliflower in a pot until soft. Drain water. Naturally Engineered has just released the second annual Paleo Community Survey. It only take a few minutes to fill out, so it'd be great if you can do it! Click! Like you, I love Indian food, so I was very happy to stumble upon your recipe (and blog) via MDA. I'd love to subscribe to an RSS feed of your blog (I keep track of my blogs through iGoogle). Do you think you'll start an RSS feed anytime soon? It is a great and quick recipe but I have to say it is a little heavy on the spices (and I too LOVE Indian food). I would also suggest adding none of the spices to the cauliflower, just the coconut milk as it is a good compliment to the curry. Thanks for the suggestions. I made it so spice-heavy because I'm a big fan of spices... and the cauliflower also had spices because it could either be eaten alone, with a non-spicy side, or as an extra BAM! with the curry. I appreciate the comments! I'm so glad you liked it! Thanks for sharing the photo too. Cheers! and I was cooking my lunches for the upcoming week. This is a lovely recipe, but you missed an opportunity by not making it "the Seven C's!" Seriously, though, a lovely curry. 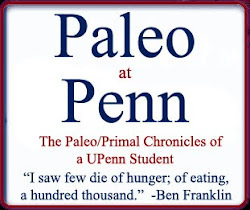 I'm a May 2013 Penn graduate and have been Paleo/Primal since February 2010. This blog will discuss health and nutrition, the Paleo/Primal lifestyle, and ancestral wisdom in general. Paleo aside, I'm a linguistics major, music minor, libertarian, pianist, singer, poet, thespian, Sagittarius... and nerd. Disclaimer: I'm not a doctor, nurse, nutritionist, or registered anything, nor am I in training to become any of the aforementioned professions. I'm just a college student who has changed her life and has done a ton of independent research to come to the opinions/conclusions of this blog.